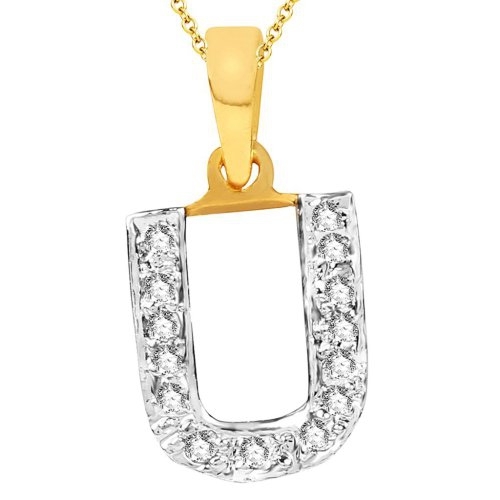 • Brand: Sukkhi • Product Type: Alphabet• SKU: sukkhi_alpha_U• Colour: White and Golden• Material: Alloy• Plating: Rhodium and Gold• Stone Used: Cubic Zirconia• Design: CAD/CAM• Dimension: Pendant: L: 2.25cmWeight: 1.5g• Description: This Sukkhi Cubic Zirconia Stone Studded Alphabet 'U' Pendant with Chain is made of alloy. Women love jewellery; specially Cubic Zirconia jewellery adore a women. They wear it on different occasion. They have special importance on ring ceremony, wedding and festive time. They can also wear it on regular basis . Make your moment memorable with this range. 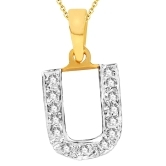 This Cubic Zirconia jewellery features a unique one of a kind traditional emblish with antic finish.• Care label: Avoid of contact with water and organic chemicals i.e. perfume sprays. Avoid using velvet boxes, and pack them in airtight boxes. After use , wipe the jewellery with soft cotton cloth. • Note: The image has been enlarge for better viewing. • Disclaimer: Product colour may slightly very due to photographic lighting source or your monitor settings.